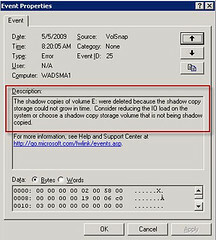 What situation would the IT Department use a volume shadow copy, instead of a backup strategy? If the user accidentally overwrites a presentation he spent all day creating. Note that shadow copies maintain a maximum of 64 copies of a file. The copy schedule affects the amount of time that the oldest copies are deleted. Microsoft recommends writing shadow copies to a different volume on a different drive than the shared folders. You should not write shadow copies to compressed volumes. Compressed volumes cannot have an allocation unit size of greater than 4 KB. Using a volume with an allocation unit size of less than 16 KB can result in loss of shadow copies.